This second portrait of Larry Levis attached to the one-way sign at the corner of Laurel and China streets in Richmond, Virginia appeared in summer 2011. The piece was knocked from the pole during Hurricane Irene and is here photographed by Blackbird senior editor Mary Flinn on her nearby porch steps. The image, with lines from Levis’s poem, “Boy in a Video Arcade,” replaces a similar image which appeared at the same location in 2007. 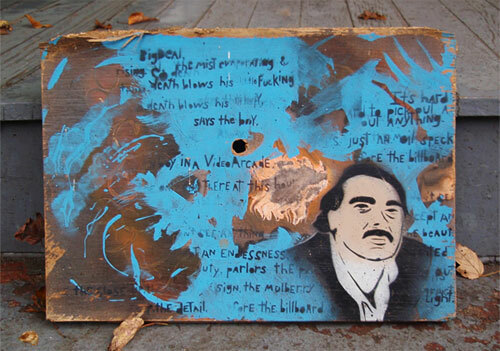 Like its previous version, the portrait mimics graffiti on painted plywood. 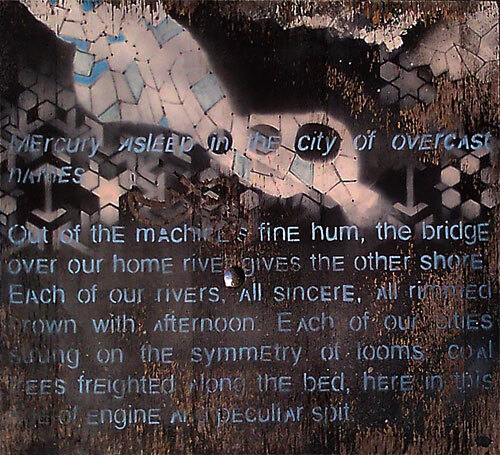 This piece of street art was discovered on Richmond’s South Allen Avenue in May 2011 and contains a stenciled depiction of Joshua Poteat’s poem, “Mercury Asleep in the City of Overcast Names.” Poteat was Levis’s student at Virginia Commonwealth University. As in previous works by the street artist that feature poems by Levis himself, blue and white stencils of snowflakes are present and spray-painted on a piece of square plywood. 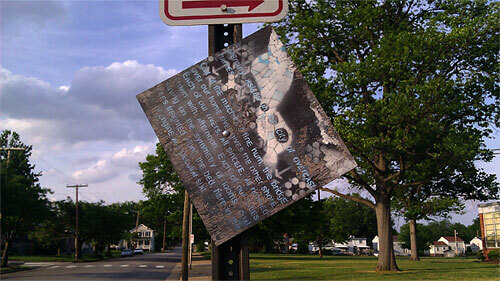 The photograph was contributed by Matthew Myers, a former Blackbird staff member and the photographer for an earlier piece of Levis street art that appeared in v8n2. Myers discovered this most recent find on a bike ride to the James River.